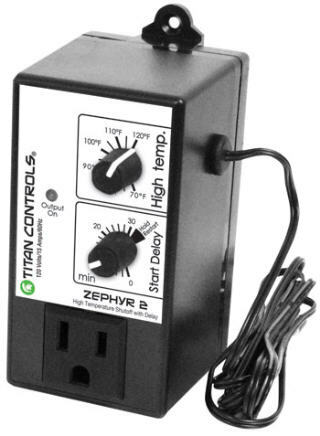 Titan TITAN ZEPHYR 2 HIGH TEMPERATURE SHUT OFF THERMOSTAT ETL LISTED (702750) SEEDS ETC. The US/Canadian ETL listed Zephyr 2 is the answer for the grower that has high heat issues created by the HID lights & environment in their garden. It shuts down your lighting system if the heat exceeds your preferred temperature setting, and then delays the 'striking' of your lights from one(1) to thirty(30) minutes to avoid hot starting them and potentially damaging your lighting system. We've also added a 'HOLD' feature to this controller to manually restart your light bank, if required. Innovative and easy to use, Titan Controls!